"Vande 'ham means 'I am offering my respectful obeisances.' Vande. V-a-n-d-e. Vande means 'offering my respectful obeisances.' Aham. Aham means 'I.' Vande 'ham sri-gurun, all the gurus, or spiritual masters. The offering of respect direct to the spiritual master means offering respect to all the previous acaryas. Gurun means plural number. All the acaryas, they are not different from one another. Because they are coming in the disciplic succession from the original spiritual master and they have no different views, therefore, although they are many, they are one. Vande 'ham sri-gurun sri-yuta-pada-kamalam. Sri-yuta means 'with all glories, with all opulence.' 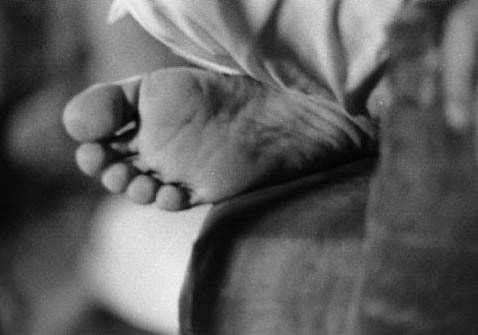 Pada-kamalam, 'lotus feet.' Offering of respect to the superior begins from the feet, and blessing begins from the head. That is the system. The disciple offers his respect by touching the lotus feet of the spiritual master, and the spiritual master blesses the disciple by touching his head. Therefore it is said, 'I offer my respectful obeisances unto the lotus feet of all the acaryas.'' Sri-yuga-pada-kamalam sri-gurun vaisnavams ca. Gurun means spiritual master, and vaisnavams ca means all their followers, devotees of Lord. "Spiritual master means they must have many followers. They are all Vaisnavas. They are called prabhus, and the spiritual master is called Prabhupada because on his lotus feet there are many prabhus. Pada means lotus foot. So all these Vaisnavas, they are all prabhus. So they are also offered respectful obeisnaces. Not that the spiritual master alone, but along with his associates. And these associates are all Vaisnavas, his disciples. They are also devotees of the Lord; therefore they should also be offered respectful obeisances. This is the process. Then sri-rupam. The spiritual master is descending from the Six Gosvamis. Out of the Six Gosvamis, Sri Rupa Gosvami and his elder brother Sanatana Gosvami are heading the list. Sri-rupam sagrajayam. Agrajatam means his elder brother, eldest brother. Sri-rupam sagrajatam saha-gana-raghunathanvitam. They are also associated with other Gosvamis, two Raghunathas, raghunathan, plural number. There were Raghunatha dasa Gosvami and Raghunatha Bhatha Gosvami. Then Sri Jiva Gosvami. So all they are offered respected obeisances one after another. "And after finishing respectful obeisances to the spiritual master and the Gosvamis, then we approach Lord Caitanya. Lord Caitanya is also approached with His associates. Savadhutam, sadvaitam. Sa means 'with.'' Advaita, Advaita Gosai. And avadhuta means Nityananda. So with Advaita and with Nityananda, the offering goes to the Lord, Sri Caitanya Mahaprabhu. So after finishing all these obeisances one after another, according to the system, then sri-radha-krsna-padan, then we approach Radha and Krsna. Radha-Krsna is also associate. Krsna is associated with Radharani, and She is associated with Her immediate companions like Lalita, Visakha, and others. So this is the process of offering respectful obeisances to the Deity. We cannot approach Radha-Krsna directly. We have to approach through the spiritual master, through the Gosvamis, through the associates of Lord Caitanya. Then we approach Radha, then Krsna. If one approaches Krsna through this channel of disciplic succession, his efforts becomes successful. Otherwise, if he wants to approach Krsna directly, it will be futile endeavor."